Double duty chrome that works with both gel AND lacquer. This first to market, professional-use-only system transforms clients’ nails with attention getting chrome effects whether they love gel or classic lacquer services. • Tin Man Can: Titanium and Graphite chrome powder hammer it out to create a futuristic image of man. If he only had a heart. • Bronzed by the Sun: Feel the heat with this bronze chrome powder. Nails bare a luminous glow as they capture the warmth of the fading sun. • Great Copper-tunity: Opportunity knocks with a copper that rocks in chrome powder. Try this amazing color! • Blue "Plate" Special: Be a glutton. 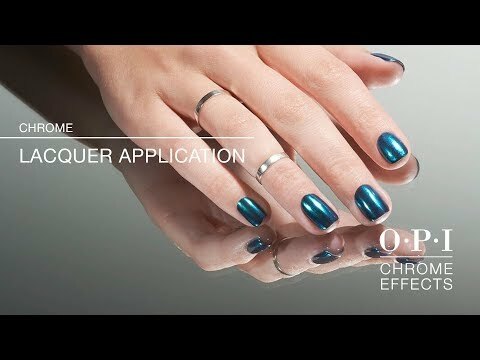 Make sure you order this metamorphosis blue from OPI’s Chrome menu. • Amethyst Made the Short List: OPI captures the earth’s mystique with the glow of amethyst crystals and purple geodes in these chrome powders. • Pay Me in Rubies: Pay it forward. Enjoy this rich jewel chrome powder saturated with intense color. Don’t forget to spread the wealth. • Mixed Metals: Crazy mixed up minerals create a mind-blowing alternative for a glamorous chrome powder metallic look. • Gold Digger: The gold standard will never be the same with this chrome powder. OPI tips the scale with 24 karats of pure radiance. Chrome Effects is rated 4.5 out of 5 by 2. Rated 5 out of 5 by Hairbiz from Chrome Effects Works like a charm! Endless design possible with this collection. The colors are good for all seasons and occasions. They are a very easy way to JAZZ up any polish color. Versatile, good on gel polish and lacquer. You can mix them with polish for nail art too. We will have lots of fun with this product. Be prepared for the ooos and aahs! Rated 4 out of 5 by Dragonfly from Love the Chrome Effects powders! I’m so excited to offer this product to my clients! It’s been a big seller for me.